This lovely, detached holiday cottage is situated near Beaufort, in County Kerry, with pretty views of Carrauntoohil - the highest peak in Ireland. The cottage is situated next door to the owner's home with off road parking and an open plan living area with a kitchen, dining table and sitting room. Beside the sitting area is a shower room whilst upstairs are two bright bedrooms. Each has a Velux window and its own wardrobe; one has a double bed and the second has twin single beds. Outside is a lawned garden and a gravelled patio with folding chairs. 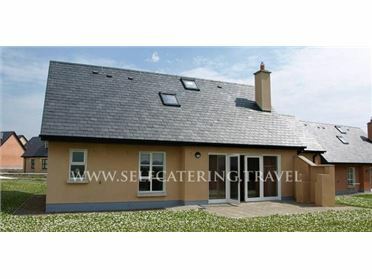 A wonderful holiday home for exploring County Kerry. Situated between the towns of Killorglin and Killarney in County Kerry is the quiet village of Beaufort. The village has shops and pubs, but the main attraction is the breathtaking mountain views, and nearby, the stunning Gap of Dunloe and the rugged, scenic Macgillycuddy Reeks are well worth a visit. Also nearby is the spectacular Killarney National Park which is a haven for walkers, wildlife enthusiasts and cyclists. The popular town of Killarney has numerous attractions, shops, pubs and bars with many playing traditional music. The town also hosts annual festivals. For those you enjoy the great outdoors, there are a number of activities in the area. Along with walking and cycling, golf, fishing and riding can all be enjoyed. With many attractions and activities to see and do, this area of County Kerry has something for everyone.